Boil together	for 1	minute	the last 5 ingredients. When cool, pour over vegetables and marinate. Serves 10 to 12. Keeps 3 weeks. 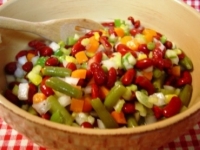 Recipe categories: Side dish, Beans, North american.